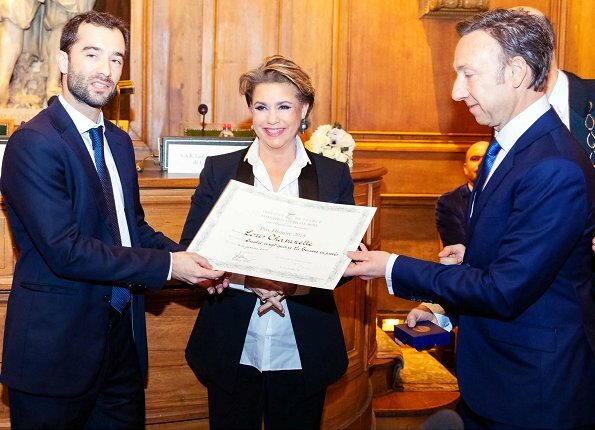 On January 16, Grand Duchess Maria Teresa attended the Stephane Bern Foundation's 2018 awards ceremony, held at Institut de France in Paris. 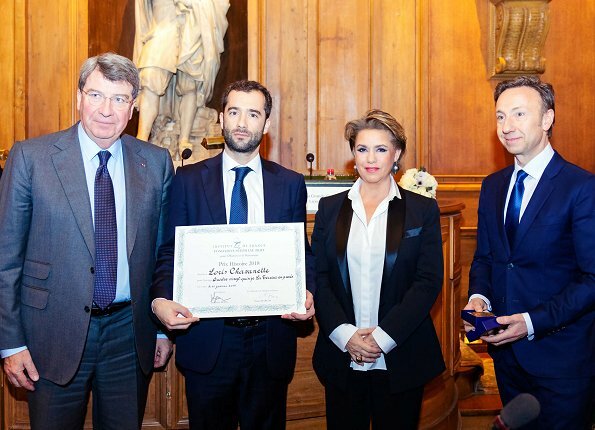 The history prize was given to Loris Chavanette for his book “Quatre-vingt-quinze, La Terreur en procès”. A heritage prize was meanwhile awarded to the association “Les Chemins du Mont Saint-Michel”. 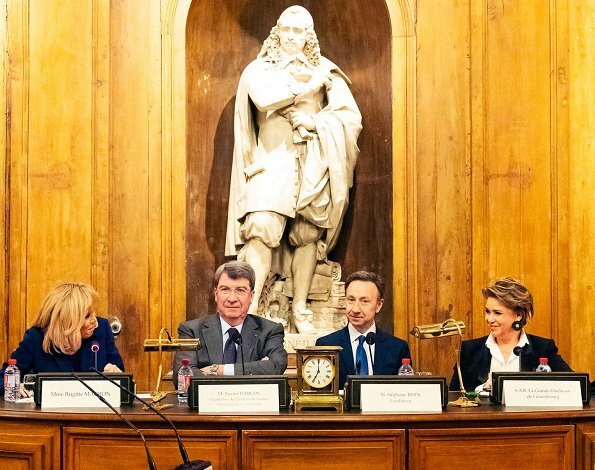 The prize-giving was held in the presence of First Lady Brigitte Macron. Omg she looks amazing! She has lost weight! A lot of weight. Good for her! She looks 10 yrs younger! She does look really great! She's not just thinner, she looks healthy, so she's probably eating healthily instead of 'fad' dieting. Madame Macron is quite a fashionable lady! G.D. M.T. is so pretty and I love her outfit. Very slimming!! M. Macron looks so good too! Love the color of her dress!! In aanwezigheid van H.K.M. Farah Diba van Perzië. Sadly I have to say:The Grand Duchess and the Grand Duke look much younger than their heir to the throne and his wife...and much more stylish. Agree. It seems that youth really comes from inside. Very true. I agree. What has happened to guillaume ? Saw pictures of the funeral. He has aged. MT looks really stunning! What an attractive and charming lady she is. This kind of pics should be informal what means without photoshopping, but in these ones manipulating is clear. Just look the sofa in those bigger group pics. And of course Maria Theresa could not have lost 15 kg (+ all her wrinkles) in one week. Lovely outfit and I like Maria Teresa's hair and make up here. The loose shirt not tucked in at the waistline is much more flattering than the other day. Agree about the photoshopping - judging by some of pictures we see MT must lose and gain weight every other day!!! 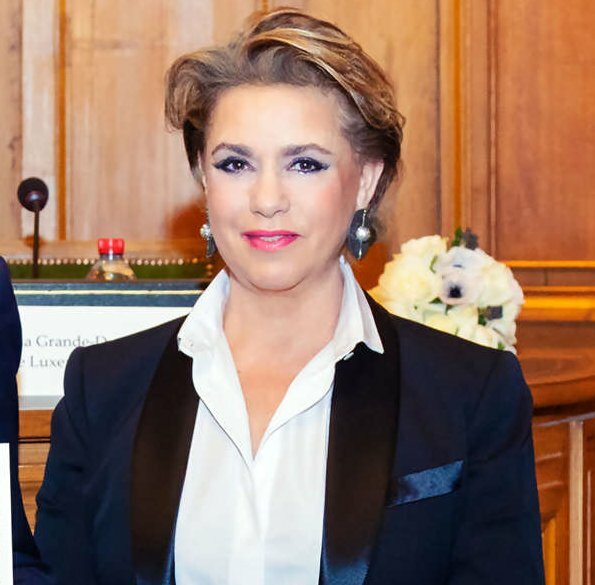 Maria Teresa looks amazing. Absolutely amazing. The tux looks so good on her. She looks healthy and trim, and very modern. Though obviously retouched, the reason, IMO, that this outfit and jewelry works so well, and would on most women: it's open down the front without a portrait collar or necklace, and without the horizontal bustline of a dress. It's youthful and slimming. That actually makes it so stupid that those photos have been photoshopped so much. MT would have looked great without it really. There is a rule that when photographer takes informal pic, that means pic from informal situation like giving price in this pic is or news etc, pics should be like they are (only normal light etc correcting OK), but people should be left like they are IRL. That is not case here. Portrait pics and magazine pics can on other hand be photoshopped as much object or photographer likes.